Doug Christie, the Canadian lawyer who represented most of the Canadian anti-Semites and Holocaust deniers who ended up in court over the past thirty years, has died at the age of 66. Christie was not a disinterested, ACLU-type who defended his clients out of principle. His celebrity appearances at extremist events over the years suggest a comfort with their ideology – if not a positive adherence to it – that I found troubling. I am not the only one: In a 2000 expose of Christie in NOW Magazine, it was revealed that in 1993, several top officials of Canada’s Law Society expressed their concern over Christie’s ideological identification with his defendants. 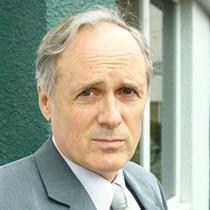 Harvey Strosberg, the discipline chair of the society, said that Christie’s comments at a trial in which he defended an accused Nazi war criminal “clearly disclose that he has crossed the line separating counsel from client: he has made common cause with a small, lunatic, anti-Semitic fringe element in our society.” Indeed. Christie spoke at the Seventh International Revisionist Conference of the Institute for Historical Review in 1986 and at Holocaust denier David Irving’s third “Real History Conference” in 2001; he also sent a taped presentation to Australian extremist Fredrick Toben’s 1998 Adelaide Institute Conference. In addition to Christie’s activities on behalf of Holocaust deniers and other extremists, he was also the leader of the Western Block Party, which advocated that Western Canada secede from the central government. He had a personal homepage and a YouTube channel. Needless to say, many anti-Semites are mourning Christie. Paul Fromm eulogized him at his funeral. Canadian extremist Marc Lemire seems particularly bereft, having documented Christie’s funeral and having compiled a list of encomiums to him by the likes of Barbara Kulaszka, Ezra Levant, and Mark Weber. Ingrid Rimland Zundel has reposted some of that on her Zundelsite. Michael A. Hoffman II has also chimed in, and sundry mourners can be found over at Stormfront and CODOH. No word yet on whether we’ll hear from Bishop Williamson. This entry was posted in Anti-Semitism, David Irving, Doug Christie, Fredrick Toben, Holocaust denial, Institute for Historical Review, Mark Weber, Michael A. Hoffman II, Paul Fromm, Richard Williamson, SSPX. Bookmark the permalink. Christie’s IDEOLOGY concerned freedom of speech. In this, we may consider him in concert with his clients, and possibly even with the poster as well, at least in selected viewpoints. Christie evidently was also in concert with his clients in matters that they (Christie and his clients) considered matters of historical fact. I see no reason why a lawyer and his clients shouldn’t agree on such matters. Even in Germany, where it is a crime to publicize such beliefs, it is not criminal to HOLD such beliefs.